Why Bring the Man Therapy® Campaign to Your Community? Man Therapy® was created as a comprehensive public education campaign that allows local partners to bring the campaign to their community, customize the Web site with local resources, and implement an integrated, local outreach campaign. And we want to share this important work with other organizations and communities that want to change the stigma around men's mental health. Offers a groundbreaking, effective, integrated, turnkey outreach program that addresses men's mental health issues and suicide prevention. Effectively reaches men and their loved ones and increases mental health literacy for your community. Allows local partners to easily implement integrated, comprehensive outreach efforts. Provides for specific local listings and resources to be added to the website including counseling centers, mental health resources, licensed therapists, partners and sponsors. Licensing agreements are negotiated on a case-by-case basis based on population and intended use of the campaign. It is our intention to distribute the campaign as widely as possible to outreach partners, while also generating ongoing funding sources to continually maintain, enhance and expand the campaign components including the web site and promotional materials. Funds received through licensing agreements support program improvements. The promotional partnership package includes licensing rights to the Man Therapy® campaign and all of the assets noted below for use in your community. Licensing also includes any assets created for specific populations (e.g., Military/Veteran, First Responders) and any new assets created throughout the licensing period. Partners receive localized data on utilization for their geographic region for the duration of the contracted licensing period. In addition to the assets below, partners become a part of a collaborative network of other partners, Man Therapy program founders, national advisory participants, and other stakeholders. Website: Use of mantherapy.org, and the opportunity to collaborate in future development. Be listed as a partner and receive a customized resources section including listing local resources, programs, therapists, partner links and sponsors. 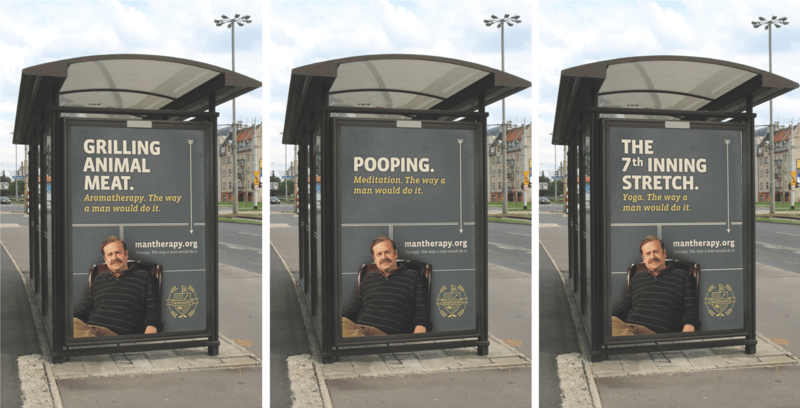 Access to turnkey marketing for the Man Therapy campaign including advertising, PR and social media assets. To get involved with local Man Therapy efforts in your state, see the list of current and past partner contacts below.